If you love making a batch of chili for a crowd, why not shake things up a bit and prepare a white bean and chicken White Chili instead! Making chili in the MultiPot Pressure Cooker is also a great time saving solution for busy weeknight meals. Tantalizing flavor and heat are infused into every bite from both poblano and jalapeno chile peppers. A dash of cumin adds that distinctive smoky flavor we love in a bowl of chili. This Mexican-inspired meal is quick and easy, with dinner on the table in just about 30 minutes. Adding a couple of tablespoons of masa harina to this recipe thickens the White Chili and adds flavor. If you don't like cilantro, try substituting parsley or thinly sliced green onions as your final garnish. Serve with warm soft tortillas or your favorite chips to round out the meal. Per Serving: 496 calories; 13g fat; 42.3g carbohydrates; 53g protein; 110mg cholesterol; 752mg sodium. 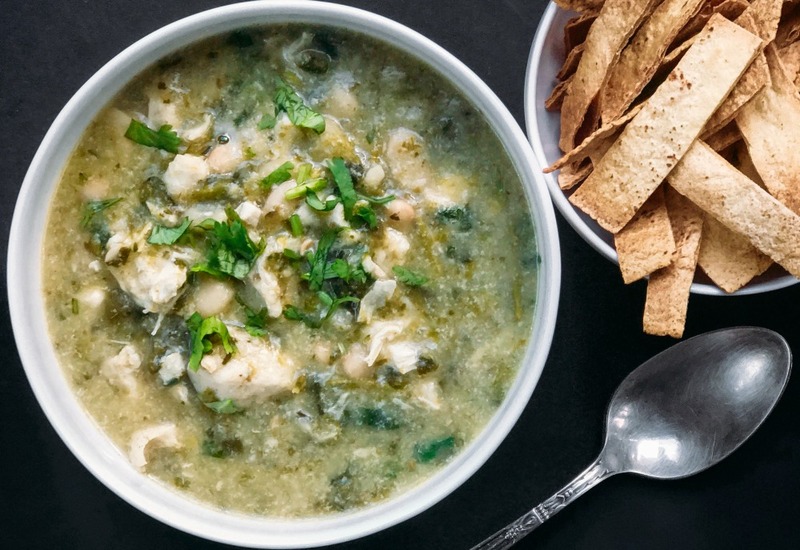 This chicken and white bean chili is perfect for cold weather days. The cumin and garlic give it traditional, delicious flavor. The chicken was also very tender and flavorful. I can't wait to make this dish again. Chicken was perfectly cooked, and I love the spices. Ideal for easy fall/winter dish for the family. I have some masa harina on hand from when I made tamales, so I used it in this recipe to thicken the chili. Such a great idea! Sliced green onions and cilantro were the perfect garnish. Great dish! I’m one of those people that doesn’t like cilantro, it seriously tastes like soap. I skipped it all together and didn’t replace it with anything. I love white chicken chili though, this recipe quick, easy and full of flavor. We had a family at my kids school that was in need so we all gathered together to make meals for the family. I made this chicken chili because I know it would keep well in the fridge. It smelled so good I had to make a batch for myself! We ate it with chips, it was so good. I added lots of cheese, which made it that much better. I loved how easy and delicious this dish is! I gave four stars since I modified the recipe. The slow cooker version called for chicken broth but this recipe called for water. I’m uncertain why you would want to use water. I will be making this recipe many more times! This was my first MultiPot dish! Followed the recipe. Was wonderful but I will definitely add a bit more cumin next time and perhaps add another spice as it was a little bland for our taste. Masa harina creates a great consistency. Loved it! But I will definitely add more cumin next time. The cilantro was a nice touch. Very tasty!